The series of protests, beginning earlier this week and planned to continue into next, saw over six thousand people take to the streets of central Kiev on Tuesday in several separate manifestations. Police responded by blocking off the downtown area and moving five thousand police and National Guard servicemen into the area to control the situation. Protesters gathered in several areas in the city center, including in front of the country's parliament, where organizers installed a mock 'toilet' symbolizing the constitution of Ukraine, which they said has been 'flushed' by Ukrainian authorities. At least ten associations and parties have come out in support of this week's manifestations, which organizers say could grow to up to 50,000 people in the coming week. On Monday, protesters marched in front of several banks which recently filed for bankruptcies. Depositors accused the president and his administration for what they claimed were artificially-inspired bankruptcies. Moving on to the Central Bank building, protesters called on Bank head Valeriya Gontareva to resign. Protesters, some organized by political parties including ex-Prime Minister Yulia Tymoshenko's 'Fatherland' and a new opposition party called 'For Life', also came out to mark their dissatisfaction with President Petro Poroshenko and his team's social policy. They shouted slogans including 'Presidential gang – get out!' and 'impeachment for offshoreniks and liars!'. Organizers slammed authorities for the IMF-mandated increases in electricity, gas and water prices, as well as what they called a 'Chernobyl' of cuts in social benefits. People take part in a rally, near the National Bank in Kiev, Ukraine, Tuesday, Nov. 15, 2016. Next Monday, ultranationalists are expected to join the fray with their own protests on the Maidan Nezalezhnosti (Independence Square). The groups vowed to 'remind' President Poroshenko and the government that they are in power thanks to the nationalist gangs' efforts three years ago, and that the country's current leaders are proving themselves to be little better than the old ones. This week's mass demonstrations come amid the third anniversary of the beginning of the so-called Euromaidan protests, which culminated in the ouster of unpopular but democratically elected President Viktor Yanukovych in February 2014, and helped spark a crisis in relations between Russia and the West. In preparation for the protests earlier this week, Ukrainian Interior Minister Arsen Avakov urged security forces to take 'tough measures' against protesters in the event that the situation gets out of control. He instructed them to "act quickly, decisively and professionally," adding that "provocateurs and rioters should be detained and isolated. The details of their involvement, guilt and punishment will be determined in court." Political observers familiar with the situation warned that they could not rule out the introduction of martial law in the Ukrainian capital in the event that the situation gets out of control. The reaction of Ukraine's politicians and media to the protests has been to blame Moscow. For his part, presidential advisor Yuri Biryukov suggested that demonstrators are the 'brothers and friends' of Russian leader Vladimir Putin. "Anyone who wants to yell about 'criminal authorities'' or 'unbearable [utilities] prices' is truly either consciously or unconsciously a helper, friend, comrade and brother to Putin," the official stressed. "Anyone who at this time organizes or participates in these protests, legal and guaranteed by the constitution, is rocking the army, rocking the country, putting the country in jeopardy. This is not 2013. It's not 2004. This is the third year of war," Biryukov added, referring to the civil war in eastern Ukraine, which Kiev blames on Russia. Some Ukrainian journalists and 'political experts' have gone even further, claiming that President Putin himself is personally to blame for the protests. In an article for online news site online.ua, one analyst suggested that the Kremlin is consciously trying to present Ukraine in a negative light to US President-elect Donald Trump. 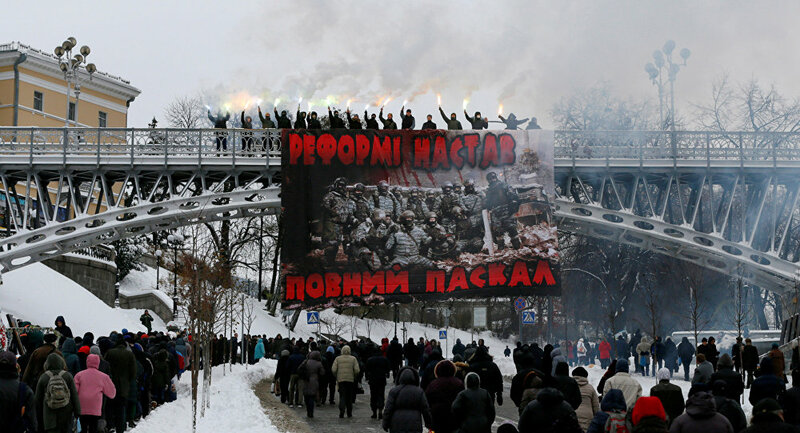 The images of never-ending protests in Kiev help Putin do so, the article claimed. The article did not go into detail about exactly how Moscow might try and influence Ukrainians to come out to the streets. 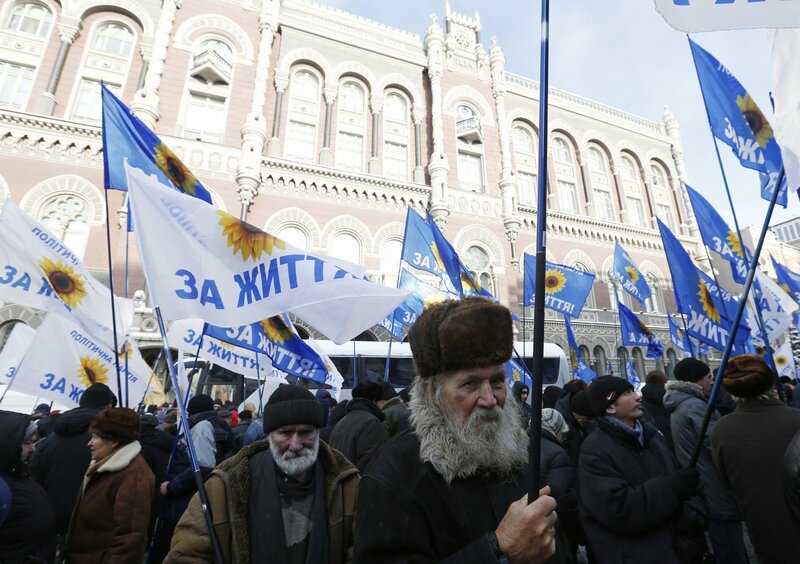 Nor did it consider that perhaps Kiev's failed social and economic policy, the ongoing war in the Donbass, and IMF-mandated cuts in social services and hikes in utilities prices may be the real cause for Ukrainians' growing frustration with authorities. Instead, online.ua suggested that "the victory of Donald Trump in the US presidential election has reassured Putin's administration, which expects a change of tone in negotiations with Washington," including toward Ukraine. "The Kremlin is interested in showing our country in a maximally unfavorable light, and to restore old fears Americans have and to strengthen them with terrible images from the streets of Kiev, a task which will allow Moscow to stake out its influence over Ukraine." Ukrainian politicians have already warned that the new protests could culminate in a 'Maidan 3.0', i.e. another revolutionary overthrow of the government. But in light of the catastrophic political and socio-economic situation Kiev's current 'revolutionary' authorities have governed themselves into, one thing is clear: as in 2004 and 2014, if the country does face another coup, Moscow won't be the one to blame.